I decided to introduce you to one of the purist recipes of Banaras today . Eastern UP to be precise . And I choose to cook only the quick ones you know . This is an everyday subzi during summer days as the guards are considered cooling for the system and they are available in plenty . Seasonal gifts of nature. I enjoy all seasonal vegetables and use them in all the ways possible. This one, sponge guard is one vegetable liked by the husband quite dearly , all it's variations . One of the variations I have posted earlier and more will be coming in future as this a regular vegetable and i have many pictures in my drafts. 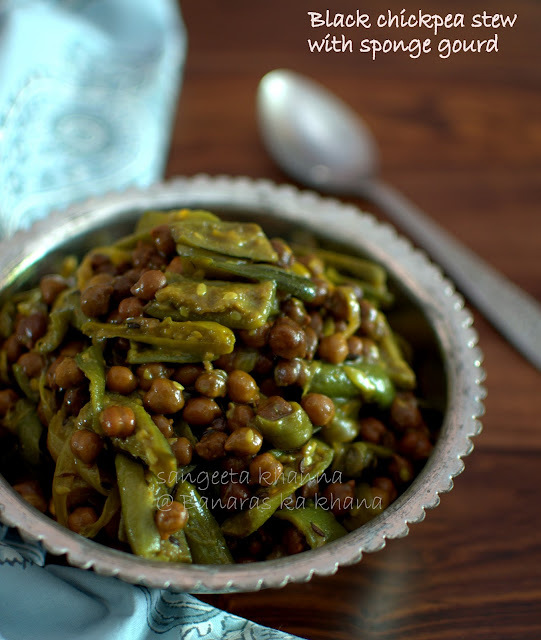 The subzi is called 'nenua chana ki subzi' or 'tori chana ki subzi' and although this is a quick recipe it needs some precision ...as it is with all simple recipes. Boil the chickpeas in pressure cooker or in a pan with enough water and salt to taste. Do the pan coking of the vegetables in the meantime. Add the sliced onions and salt to taste . Fry the onions till they start sweating . Do not brown the onions. Add the turmeric powder and mix well. Add the sliced sponge guards , mix well to coat and cover to cook . Enough water is released from the sponge guards to be cooked , just keep the flame low so it cooks slowly . Slow cooking makes this curry very flavorful . Add the boiled chickpeas as soon as they get ready . If they are cooking simultaneously , they get ready by the time sponge guards start releasing water . This is the best time to add the boiled chickpeas . Slow cooking of the chick peas and sponge guards together brings the best flavors as i said . The contrast in the texture and flavors of the guard and chickpea makes this curry very interesting. I like the way chickpeas give a nice bite with the soft slices of guard . The sponge guard has a nice sweetness to it , enhanced well by the onions . You would like the hit provided by the green chilies too, do not substitute them with red chilies or any other peppers . Actually do not substitute anything in the recipe as the ingredient list is already frugal . Try the recipe if you are not familiar with it already . I know many people have grown up eating this. We like it with chapatis or even with rice . A bowl of fresh curds is all i need with it . Love this one, with or without chana love tori/nenua this way..... :) Reminds me that haven't made this one this whole summer, time to get toris, we don't get nenuas here :-(. Looks delicious! First time here. You have a lovely blog! Do stop by my space when time permits. Nice recipe sangeeta.. I wonder how it taste with all yum ingredients, co'z it looks delicious. Sponge gourd is called Tori or Nenua in Hindi Archana.